Despite political Zionism’s realisation of the Jewish state, Jews in Israel today are deeply divided. In turn, these divisions have hampered Israel’s progress towards reaching final peace settlements in exchange for occupied land with Palestinians as well as with Syria and Lebanon. Thus the goal of acceptance as a legitimate political entity in the Middle East still eludes Israel. 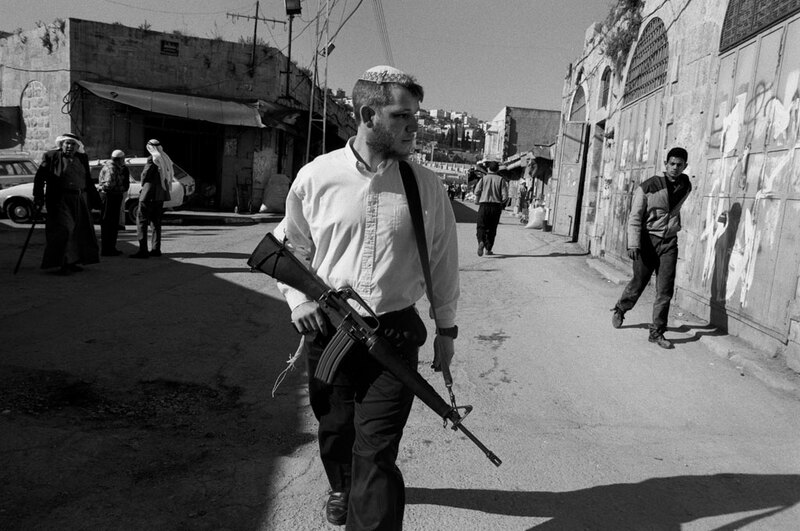 Photographed over a five year period, the exhibition takes us through the earlier uneasy co-existence between Israelis and Palestinians in both Israel and the Occupied Palestinian Territories; the ongoing conflict leading to the collapse of the peace process, even handedly documenting the powerful and incompatible forces at work. “The occupation is corrupt, and it corrupts by its very nature. It denies all human rights, including the right to property. It fills the occupied territories with an atmosphere of general lawlessness. It enriches the occupier and everybody connected with him. It creates a climate of wanton cynicism, an environment of “anything goes”. Such an atmosphere does not stop at the Green Line. It permeates the state of the conqueror. That’s where the rot [originally] set in.” – Uri Avnery, journalist, peace activist and former Member of the Israeli Knesset. “If the day comes when the two-state solution collapses, and we face a South African-style struggle for equal voting rights (also for the Palestinians in the territories), then, as soon as that happens, the State of Israel is finished.” – Ehud Olmert, former Prime Minister of Israel. Click to read “Struggling to Share the Promised Land” by Dilip Hiro (Middle East authority, author of Sharing the Promised Land as well as 35 other books). “Struggling to Share the Promised Land” by Dilip Hiro (world authority on the Middle East, author of Sharing the Promised Land as well as 35 other books). COMPETING claims to the Holy Land of Palestine by Israeli Jews and Palestinian Arabs are religious and political. They are rooted respectively in the Book of Genesis and in 19th century nationalism, which in the Jewish case became known as Zionism, named after the Hill of Zion, the site of King David’s palace. From the Hill of Zion as well as the nearby Mount of Olives, one can see the golden Dome of the Rock, built in 691 AD by Abdul Malik ibn Marwan, the Umayyad ruler based in Damascus. The Jews allude to Genesis 12:6-7: And Abraham passed through the land unto the place of Shechem [present day Nablus], unto the plain of Moreh. And the Lord appeared unto Abraham, and said, “Unto thy seed will I give this land”. As Muslims, Palestinian Arabs accept the Old Testament, and revere Abraham as the prophet who was the first to preach monotheism – the concept of No god but God. They claim that Muslim Arabs are the descendants of Ishmael, Abraham’s elder son by Hagar. They refer to Genesis 17:4, The Lord said unto Abraham: “Behold, my covenant is with thee, and thou shalt be a father of many nations”; Genesis 21:13, “And also of the son of the bondswoman [Hagar] will I make a nation because he [Ishmael] is thy seed.”; and Genesis 25:9 which alludes to Abraham’s burial by Ishmael and his younger brother Isaac, borne by Sarah, and regarded as the progenitor of the Jews. Religious Jews maintain that the return of the Jews to their Promised Land and the re-establishment of a religious Jewish state is a precondition for the arrival of their Messiah and the beginning of a golden age. In Palestine’s recorded history of four millennia, the Israelites and the Jews (a term originally applied to the inhabitants of Judah around 605 BC) ruled the country for 550 years – from 1030 to 586BC as Israelites, and then from 166 to 63 BC as (Maccebean) Jews. After 63 BC, the scattered Jews couched their aspiration to return to Zion/Jerusalem in religious terms and expressed it in liturgy. The movement gained ground among European Jews in late 19th century when, in an environment of rising ethnic nationalism, they became the targets of pogroms, especially in Russia and Central Europe. Zionism – the term coined by Nathan Birnbaum in 1893 – represented an ideology that aimed to create a Jewish state or national centre in Ottoman Palestine, the historic homeland of the ancestors of Jews. The first Zionist Congress held in 1897 in the Swiss city of Basle, chaired by Theodor Herzl, stated, Zionism strives to create for the Jewish people a home in Palestine secured by public law. Zionists from East and Central Europe set up the first agricultural commune, kibbutz, in Ottoman Palestine in 1905, thus taking the first step towards acquiring land in Palestine, a process that continues. During World War I between the Allies (Britain, France, America and Russia) and the Central Powers (Germany, Austria-Hungary and Ottoman Empire), the 1917 Declaration signed by British foreign secretary Lord Balfour committed Britain to establish in Palestine a National Home for the Jewish people. This Declaration was incorporated into Britain’s League of Nations mandate over Palestine in 1922 that followed the defeat of the Ottoman Empire in World War I. As a result, between 1925 and 1939, the Jewish population of Palestine almost quadrupled, from 125,000 to 446,000. The Arabs in Palestine protested, rioting in 1921 and 1926, and staging an uprising from 1936 to 1939, which was directed against the British mandate and the Jewish colonisers. On the eve of the outbreak of World War II in September 1939, to secure the backing of the Arab world in the conflict, Britain imposed limits on the Jewish intake into Palestine. But illegal immigration grew. In November 1947 the United Nations, the successor to the League of Nations, recommended an end to the British mandate in Palestine and its partition, giving the Jews (30% of the population) 54% of the land, and the Arabs 44%, the rest, including Greater Jerusalem, to be put under international administration. The Arabs rejected the proposal and challenged the UN’s right to divide a country without consulting its inhabitants. The Jews accepted it. In the 1948-49 Arab-Israeli War, Israel – established in May 1948 – annexed half of the area allocated to the Arabs by the UN, reducing their share to 23% of British Palestine – that is the West Bank, including East Jerusalem, and the Gaza Strip. In the June 1967 Arab-Israeli War, the Arabs lost. Israelis occupied the rest of Palestine – as well as the Golan Heights of Syria and the Sinai Peninsula of Egypt, a total of 26,630 sq miles, three-and-a-half times the size of Israel. The 1973 Arab-Israeli War left the Israeli occupation of the Palestinian Territories intact. Accepting the principle of Land for Peace, in 1979 Egypt signed a peace treaty with Israel in exchange for a full return of the Sinai Peninsula to Cairo in three stages, which were completed in 1982. Five years later, the Palestinians, seeing no end to their military occupation, resorted to attacking Israeli soldiers with stones and petrol bombs, the latter responding with tear gas and live ammunition. The uprising, popularly called the Intifada (lit. Shaking off), went through different phases over the following years. In its last phase in the early 1990s, Intifada activists focused on killing Israeli agents among the Palestinians, and destroyed Israel’s 20,000-strong intelligence network, thus making it extremely hard for Israel to reimpose full control. This, and the refusal of the Palestinian leaders to call off the Intifada, convinced Israel of the futility of continued suppression of the Palestinians and denial of their national identity and the right to self-rule. It was against this backdrop that in August 1993 – following secret talks between Israel and the Palestine Liberation Organization near Oslo, Norway – Israel recognised the PLO as the sole representative of the Palestinians, and the PLO, forswearing use of violence, recognised Israel’s right to exist in peace and security, thus abandoning its commitment to liberating all of British Palestine from Zionist colonisers. The Declaration of Principles for Palestinian Self-government, popularly called Oslo Accord I, was signed at the White House, Washington, on 13 September, by Shimon Peres of Israel and Mahmoud Abbas of the PLO, and witnessed by Israeli Prime Minister Yitzhak Rabin and PLO Chairman Yasser Arafat. Both sides regarded the agreement to be within the context of UN Security Council Resolution 242 (1967) based on the principle of Land for Peace. Oslo I provided for Palestinian self-rule in the Gaza Strip as the first step, with talks on a permanent agreement to begin after two years and to be completed within the next three. The issues for the final settlement included the future of East Jerusalem, the Jewish settlements in the Palestinian Territories, the Palestinian refugees scattered outside British Palestine, and the boundaries of the Palestinian Territories and their international status. Overall the PLO viewed the Oslo I as a one-off historic compromise, whereby it gave up its claim to all of British Palestine, and agreed to stick to bilateral diplomacy in its dealings with Israel, a formidable power. The Accord divided the Palestinians. On one side was the Arafat-led Fatah movement, the mainstay of the PLO, accepting the scenario of the present Occupied Territories as the final Palestine State – starting with the Arafat-led Palestinian Authority’s rule in two-thirds of the Gaza Strip. On the other side were Islamist Hamas and Islamic Jihad. They visualized an independent Palestine State in the Occupied Territories as a stepping stone towards the ‘liberation’ of the whole of British Palestine. Among Israelis, opposition to Oslo I came from those who claimed all of British Palestine – called Eretz Israel, Land of Israel – as their homeland. They included religious, observant – often, but not always, Orthodox and ultra-Orthodox – as well as secular, non-observant Jews. Concentrated in the Greater Jerusalem area and the Jewish settlements in the Palestinian Territories, they are best described as Maximalists: those who refuse to share the Promised Land with the Palestinians. Support for Oslo I was strong among secular, non-observant Jews, concentrated in the Greater Tel Aviv region. They are best designated as Minimalists: those who are prepared to co-exist in pre-1967 Israel on 77% of British Palestine with an independent State of Palestine with its boundaries along the present Green Line with minor adjustments. in November 1995. Shimon Peres succeeded Rabin. The elections to the presidency of the Palestinian Authority and the Palestinian Council in January 1996, with a voter turn-out of 68%, legitimized the executive and legislative institutions of the Palestinians. But the defeat of Peres by rightist Binyamin Netanyahu in the prime ministerial poll in May 1996 was a setback to the peace process. Netanyahu called the Oslo Accord a flawed, evil accord. This made the Maximalist camp, particularly its Orthodox and ultra-Orthodox members, more assertive than before. The pace of Jewish colonisation of the Occupied Territories accelerated. Despite American and European Union opposition, Netanyahu pressed ahead with the new, controversial settlement of Har Homa/Jabal Abu Ghneim in East Jerusalem. He did all he could to sabotage Oslo II. However, being an international agreement, he could not unilaterally abrogate it. When in October 1998, pressured by US President Bill Clinton, he signed the Wye River Agreement to transfer 11% of the West Bank land to Area A under the Palestinians according to an earlier Israeli commitment, the ultra-rightists in his coalition government defected, causing his downfall. In the course of Netanyahu’s election campaign against Labour’s Ehud Barak, a retired Israeli military chief of staff, ultra-hawkish Ariel Sharon urged the Jews to rush to occupy hilltops in the West Bank before the polling in May 1999. The number of Jewish settlements rose sharply. Barak, campaigning as a disciple of Rabin – a retired military chief of staff turned peacemaker – won by a margin of 12%. Of the hurriedly occupied Jewish hilltops, he dismantled about a dozen in very remote areas, leaving the settlement total at 185: East Jerusalem 13, Gaza Strip 16, West Bank 156. He renegotiated the Wye River Agreement in Israel’s favour and then unilaterally changed it. During his administratoin, there was continuation of expropriation of Palestinian land, establishment of new hilltop Jewish outposts, and expansion of the existing colonies – all in the name of safeguarding Israel’s security. At the Camp David summit of Arafat, Barak and Clinton in July 2000, Barak offered Palestinians sovereignty over parts of East Jerusalem – with the 13 Jewish settlements containing 200,000 residents to be annexed by Israel – in return for the PLO renouncing any further claims against Israel, including the right to return of 3.7 million Palestinian refugees. This was unacceptable to Arafat. The talks failed. On 28 September, Sharon’s walkabout on the Temple Mount/Noble Sanctuary in Jerusalem’s Old City under the protection of 1,000 security personnel, followed the next day by Israeli firings on Palestinian worshippers at the Al Aqsa Mosque after the Friday prayer, triggered the Second Palestinian Intifada. The subsequent ban on 110,000 Palestinians who travelled daily to work in Israel raised the unemployment to 40%. The loss of £350 million / $500 million to the fragile Palestinian economy in two months wiped out three years of economic advance. The escalation from stones to guns in the Palestinian camp and the resort by the Israelis to snipers, armour, rockets, attack helicopters and naval gunships ratcheted up the death toll to 300 among Palestinians, 13 among Israeli Arabs and 43 among other Israelis in the first three months of the intifada. The average monthly Palestinian fatalities in the the earlier Intifada was 20. Violence against Israeli targets in the Occupied Territories and inside Israel by Islamist Palestinian organisations resumed. Against this background Barak’s support in the Israeli Parliament collapsed. He resigned in December. In the February 2001 prime ministerial poll, Sharon defeated Barak by a margin of 25% chiefly because traditionally pro-Labour Israeli Arabs, forming 16% of the electorate, abstained rather than vote for Barak whom they blamed for the deaths of the Israeli Arabs demonstrating for the Palestinian Intifada. Ruling out any talks with the Palestinians on the final agreement, Sharon offered a long-term interim deal based on the Palestinian Authority controlling 42% of the West Bank and 65% of the Gaza Strip. He ruled out compromise on the status of Jerusalem which he described as the eternal and exclusive capital of Israel. In the first 15 weeks of his administration, 15 new Jewish settlements went up in the West Bank, bringing the total to 200 with a total population of 400,000. In various resolutions the UN Security Council has repeatedly affirmed that the Fourth Geneva Convention Relative to the Protection of Civilian Persons In Time of War (August 1949) applies to the Occupied Arab Territories. The Convention forbids the Occupying Power to change the demography of the territory under its occupation through such means as deportation or transfer of parts of its own civilian population into the territory it occupies. Israel has ignored this. In its May 2001 report on the Israeli-Palestinian violence, the US-appointed commission, chaired by former US Senator George Mitchell, recommended a freeze on Jewish settlements. Beyond the obvious confidence-building qualities of a settlement freeze, we note that many of the confrontations during this conflict have occurred at points where Palestinians, settlers and [Israeli] security forces protecting the settlers meet, said the Mitchell Report. Keeping both the peace and these friction points will be very difficult. Both sides accepted the Mitchell Report in principle. But, given the ill-will that exists between Arafat and Sharon (who refuses even to talk to his Palestinian counterpart by telephone), and the passivity of the Bush administration, it is hard to foresee progress in the diplomatic arena – especially when Sharon is opposed to a settlement freeze. Many Israeli people today are not much excited by the idea of gaining a hectare and then another hectare [of Palestinian land] for Israel – but for me, that’s still exciting, Sharon told Ha’aretz (The Land), an Israeli daily. This is the view of a 73-year-old Zionist pioneer, who grew up on a Jewish kibbutz during the British Mandate, and remains committed to colonizing all of British Palestine. Barring sudden death, he is set to serve his term of office until 2003. On the Palestinian side, in the recent words of Bill Clinton, Don’’t forget that the Palestinian people grow younger, less well off and more radical all the time. Therefore, the prospect of the two nations sharing the Promised Land in the near future seems dim – particularly when tension with Palestinians acts as glue that binds together the Jewish community composed of such diverse elements, secular and religious, Reform and Orthodox, European (Ashkenazi) and Middle Eastern (Sephardi).